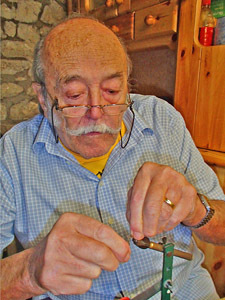 Albert Bise ties flies since nearly 70 years and was member of the most famous fly tying club of the time in the french part of Switzerland. He told me, amongst many others, the true story of the invention of the first no hackle CDC. Flyfishers had for more than 40 years a good success with the classic full hackled CDC as tied by Bickel, Joset, Veya and other fly tiers (CDC araignée). Nevertheless, there were moments when these flies did not work well. Fréderic Matthey (named FéFé), the most successful flyfisher on the Orbe river at that time, burned therefore with his cigarette the lower part of the CDC hackles of his flies- and took like this even the most difficult fish.. But the fly tiers of that time had another problem (like we have today) : the good CDC was very expensive- as expensive as gold- and difficult to get. If you have the genuine Jura CDC, you get all the cul-de-canard feathers around the preen gland of adult ducks. You will therefore always have a few very big feathers, but with stiff stems, and some very little feathers. Both are not those which are good to tie the CDC hackle collar of a classic CDC "araignée". If you do not know what to do with them, you throw them away as waste. 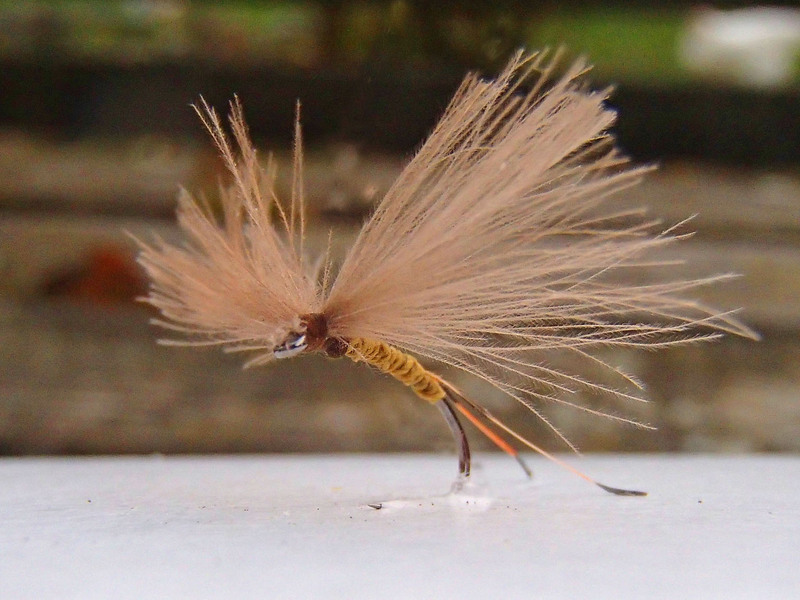 Albert Bise makes today the same flies exactly the same way as he did in 1964. He uses the smallest CDC feathers or cuts off just the fibers in the very big CDC feathers. Albert makes only a few of the "La Mienne" flies per year exclusively for Swissflies. With the same croupions and the original Zwicky silk. This no hackle CDC, is still catching a lot of good fish. If you ask for the name of the fly, Albert says "c'est "La Mienne" (my fly)". Hook size 14, handmade in Lausanne, Switzerland by Albert Bise using still the same Swiss Jura CDC, the same silk waxed with beeswax. Available in limited numbers only. 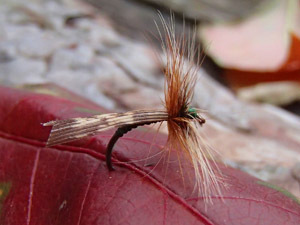 Fly tying video: Albert Bise ties "La Mienne"
Double hackled classical sedge, handmade by Albert Bise with green handwaxed silk body, marbled wings. Will catch you fish even in fast water and in the night. 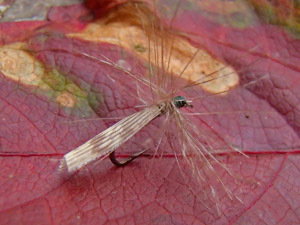 This CDC hackled sedge is falling slowly down to the water surface, where it is swallowed eagerly by trout and grayling. Body made with green handwaxed silk, marbled sedge wings, hackle CDC from the Swiss Jura mountains. 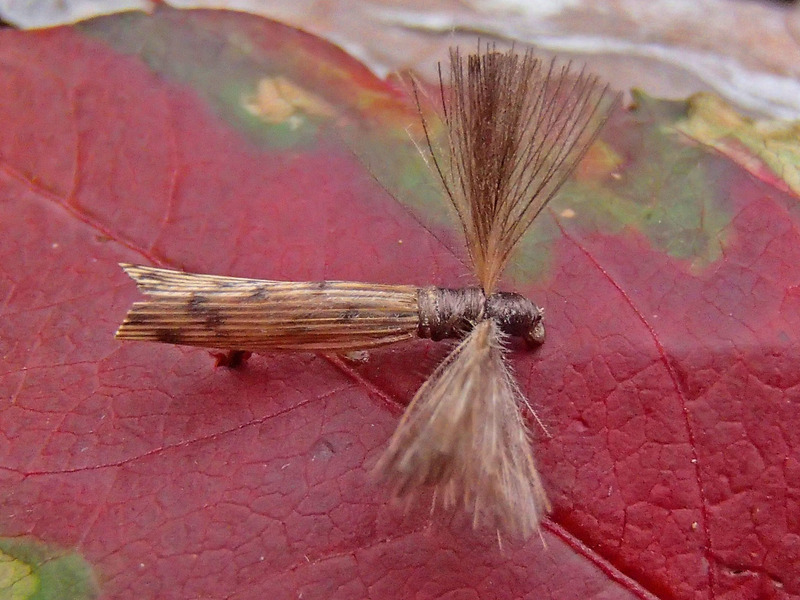 Emerging caddis flies, when getting out of the larval skin, dry their wings for a short moment before folding them backwards- that's the moment trout are waiting for. Copyright Swissflies - Swiss historical flies. 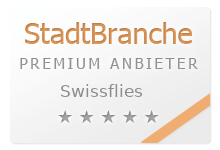 Any commercial remake is forbidden without the written permission of Swissflies and Albert Bise.